Communicate with anyone, anywhere when you don't speak the same language. Get to where you want to go, find what you want and need for less than the cost of a meal with the Kwikpoint International Translator. Business executives can communicate and accomplish what they want even when there's a language barrier. 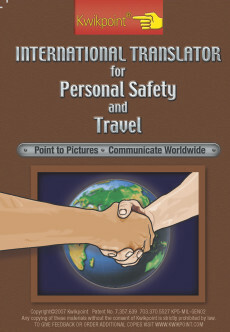 Pack a travel translator in your backpack when on exotic trips and have conversations with the locals. 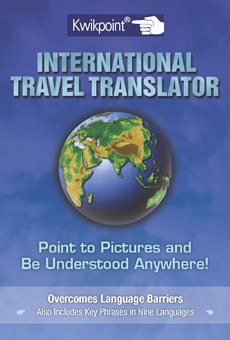 Travel translators are easy to use across age groups and cultures. When conditions are not ideal and help is needed use Kwikpoint travel publications and ask a local resident for help. The Kwikpoint International Translator contains a complete dining out section to find a meal in the most remote locations. 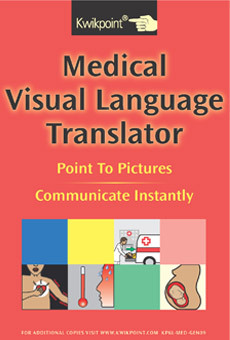 Kwikpoint International Translator is the communication system for anyone, anywhere!